ikat bag: Menagerie Pattern Coming Soon! I am in Singapore now. In other words, I'm procrastinating. However, here is a preview shot of Menagerie! All those animals in one photo. All from that single base template. No kidding. I'm working on this pattern, friends. I may be slacking off in the sunshine here, but I brought the pattern with me to slack off with. When I get back, it will go to the testing lab, and then I will let you know as soon as it's ready to buy. I just wanted to do a pre-release post with some info because I've received so many email messages from you guys asking if you'd missed the actual pattern in the deluge of daily creature-features. So no, nobody's missed the pattern. I've not finished it yet. I'm aiming for April sometime. Let me explain a few things about it first, though. At the time of writing this post, there are 14 pages templates alone. Just templates! But then, that's 14 pages of templates for 17 critters. Which isn't a lot. Because, as we keep mentioning, it's just one base template and a lot of smaller add-ons and extensions. And the same construction sequence. Which means that by the time you've made a couple of these guys, you'll be able to do the rest in your sleep. You don't need a lot of yardage for each animal - about 1/3 of a yard of fleece is sufficient. Obviously, you'll need more colors if you want to make all the different features and contrast panels, and you'll need wool felt or wool-blend felt for the smaller details. And while I made a few of my samples with fancy fur, you can really make them with regular fleece. I'll share the materials list soon. Can beginners sew these animals? I say yes- especially the simpler variations, although it really depends on what you mean by "beginner". The dragon, having lots of add-ons, and with that curved tail, will require a slightly more adventurous spirit. And remember that there are practically zero straight seams in this project. So if by "beginner" you mean "I've only ever sewn tote bags and zippered pouches and the occasional gathered skirt with elastic and I can't sew a curved seam" then this might be out of your current repertoire of skills. Go try the raccoon variation on Sew Mama Sew to see if you'll be okay with it. Most of the variations will be just like that. 4 What's In The Pattern? The Menagerie Pattern will obviously not be the same as the raccoon tutorial, because it's not raccoon-specific. After all, it has to teach you to make 17 different animals (and more). However, the pattern covers much more instruction than the tutorial, contains loads more photos (including detailed how-tos on those ears!) and focuses on the framework and concept of this base template. 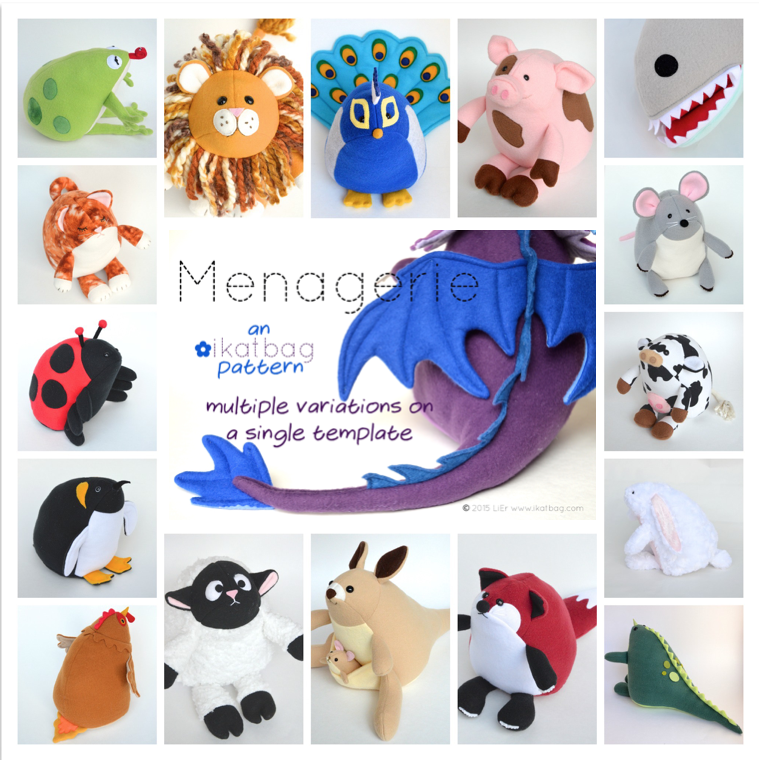 In other words, rather than paying for 17 repetitive tutorials on constructing the 17 animals, you learn how this base template accommodates the various parts of the animal - how to add limbs, ears, eyes, tails, how to make hooves, paws, bulgy patches, spines, horns, bills, and how to make flat, padded and filled shapes for wings, feet, tails. I wrote it to empower you to create your own animals from this base template, beyond the 17 I've included for inspiration. Think of it as learning to make just one project, but being equipped to turn it into many, many more. My kids have been beyond thrilled to watch me turn out animal after animal in my sewing room. They were very disappointed when I announced that I was finally stopping! This is one of the pages from my drawing pad - you can see the original concept sketches and how the final versions may or may not have looked like them. You can also see some of the critters that I chose not to make, because they were too similar to some of the others that made the shortlist. I loved this project - it came out of nowhere and brought me and the kids so much joy during the horridest and boringest part of the winter. My favorite part was being able to involve my girls so much in the design process. They had so many wonderful ideas! I found Kate's sketches and took some pictures to show you - it turns out that the fox was hers, after all! And she badly wanted a horse, but we never got round to making one. Maybe you can! I hope you're as excited as I am for Menagerie. I can't wait to share it with you! Oh, the decisions I foresee! 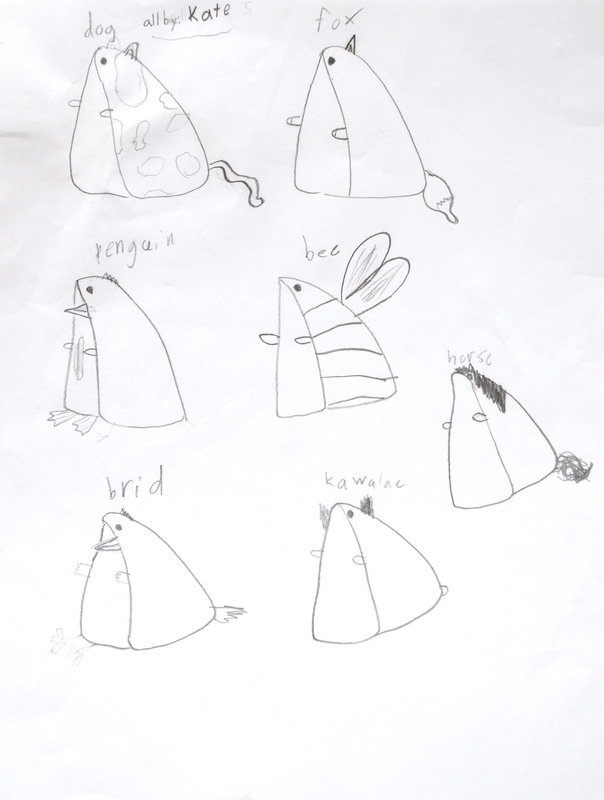 :) Loved your assistant's drawings (well, yours, too, of course)... how fun to have the girls' input! This is why I've been stockpiling fleece for ten years, isn't it? Animals for all! Enjoy your time in Singapore. Can't wait for the Menagerie! It´s a great sight to see this colorful bunch of cuddly creatures! 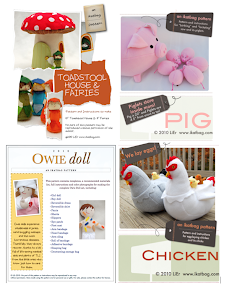 I absolutely love your little creatures and can't wait for the pattern to be released!!! So many options and all so cute! I cannot wait for the pattern. Will you be taking credit cards because I do not have a PayPal account? Dk's Wife: Yes, I can set up a credit card transaction for you. 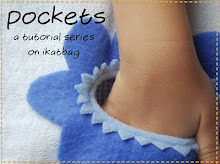 When the pattern is available for sale, email me and I will get it set up. There will be a lag time of a few days between the time you've paid and when the link can be sent to you to download the pattern file, because credit card payments take some time for the bank to process them. That is great! Thank you so much!!! I am so excited about this pattern. The other day, I was telling my three-year-old daughter that I was looking forward to teaching her to sew. When my husband asked her what she would want to sew first, she said, "Animals." It led to a discussion of all the different animals she would make...and all of them could be made with your pattern. I am awaiting its debut with great anticipation!! P.S. I am so impressed with Kate's idea sheet!!! They are so great! I LOVED seeing the drawings and the process. 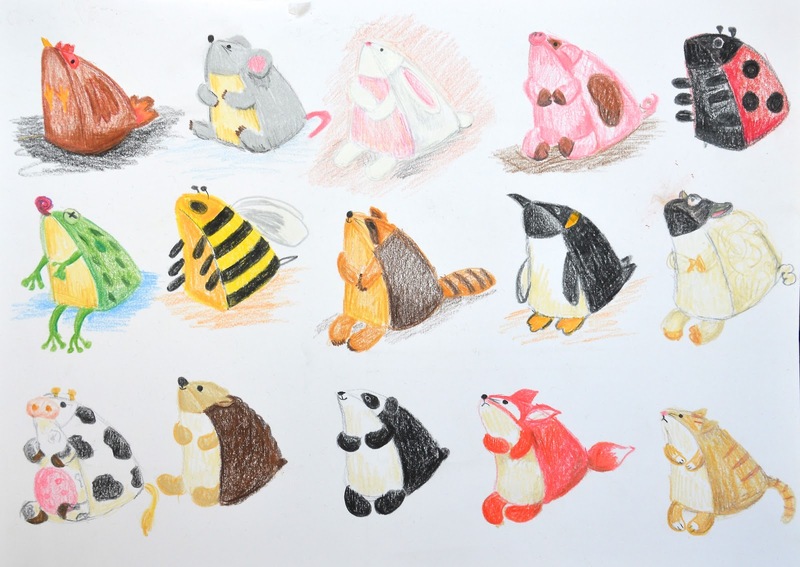 Love the concept so much, I think you are wonderfully creative to come up with one template for so many animals! Was the bottom drawing of Kate's a koala? Hilarious! And so cute! Such a great collection of critters. I really appreciate the variety you've created from one basic shape! What a great way to brighten up winter! Your patter looks incredible. I loved following this series and I really want to buy the pattern. But am I remembering correctly, did you say you're not selling in Europe anymore? What a wonderful process. I'm so impressed with the way you are teaching/encouraging our kids creative side. Kate's drawing are fabulous. I hope you're having a great time in Singapore. We've certainly shrugged off the mild weather and turned up the heat in the last few weeks.